People Against the River Crossing: Were You There? 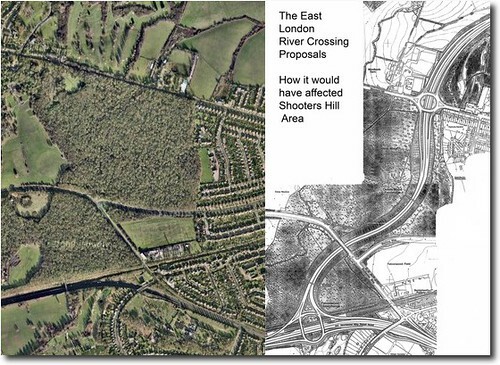 July the 8th 1993, central government withdraws the Oxleas Woods section of its infamous Roads to Prosperity scheme. The hill is saved! I’ve been asked whether I’d like to investigate this, and since this is quite possibly one of the most significant things to ever happen here, it seems like a good idea for this site to cover this part of the Shooters Hill story. Since this is a relatively recent episode, and an example of people power, I’m hoping to include some thoughts from those who participated in and observed the saving of the woods. So, if you were there, and would like to reminisce, I would like to hear from you. If you are interested please get in touch via the email address at the foot of the page. 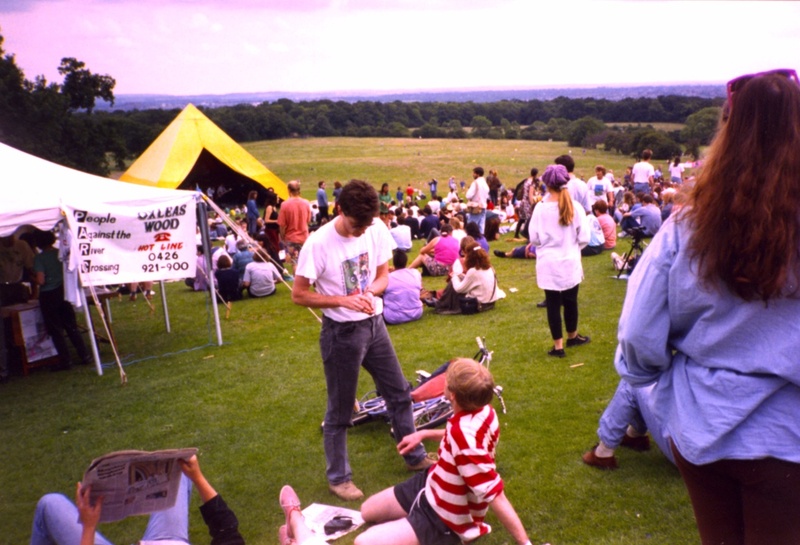 “Whenever I used to visit Oxleas Wood I would visualise the proposed road cutting through it. It’s hard to believe that the woods are now safe. But safe they almost certainly are! My involvement in the campaign against the East London River Crossing began in earnest in the late eighties. By this time the road had been scheduled for construction for many years and had already been approved by the longest Public Inquiry ever held into a road scheme. That inquiry had lasted 194 days; the transcripts of the proceedings contained 9.5 million words! 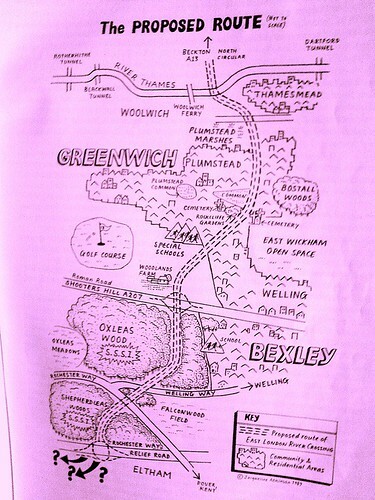 Local people, in the form of People Against the River Crossing (PARC) and Greenwich & Lewisham FOE, were fighting a determined and exhausting battle against a scheme which would not only cut a swathe through 8,000 year old Oxleas Woods but would also take out several hundred houses in the quiet and pleasant suburb of Plumstead. But with approval in principle granted, and with the Government, developers and some socialist local authorities strongly supporting the scheme, the odds against stopping it were getting bigger all the time. To achieve victory, a concerted strategy was needed to make Oxleas Wood a big issue locally and give it wider significance – a strategy to make it a symbol of the environmental damage that the road programme was causing and a rallying point for the environment movement. If that could be done, then, given Oxleas Wood’s proximity to Westminster, it might force the Government to back down rather than risk confrontation with a united community and environment movement, in its own “back yard”. Like all the best campaigns we fought on every level. There were letter-writing stalls at the popular Greenwich market, politicians were systematically lobbied and a well-presented public transport alternative was drawn-up. We organised an “Adopt-a- Tree” scheme; the aim here was to get every tree in Oxleas Wood adopted. As well as bringing in funds and publicity, it would give supporters a real stake in the campaign. And if the worst came to the worst we could invite tree adopters to turn up to defend their tree. In order to make Oxleas a “line in the sand” for the environment movement, we got some of the large environmental non-government organisations (for example the Wildlife Trusts and World Wide Fund for Nature) to take part in an Oxleas Strategy Group. This helped lock them into a campaign that was ultimately run by local people, but which made the best use of the resources of the national campaigns. A couple of legal lines of last resort helped propel the campaign into the national news. The Government had failed to carry out an Environmental Impact Assessment for the scheme, as required by European Community law. The heroic European Commissioner for the Environment, Carlo Ripa di Meana, took up this complaint causing Prime Minister Major to hit the roof and interrupt a Commonwealth conference to condemn the EC’s action. The complaint was never seen through by the EC, but the publicity was invaluable, as was that which resulted from a High Court case where the “Oxleas 9” (nine local people) put their assets on the line to take the Department of Transport to court over their failure to provide adequate land in exchange for the damage to Oxleas woods. The case was lost, but Oxleas had caught the public imagination and the pressure on the government was intensifying. Meanwhile, campaigners were preparing for the worst. A “Beat the Bulldozer” pledge was launched, with the aim of getting 10,000 people to pledge to be there if the bulldozers went in. With the TV pictures of direct action at Twyford Down fresh in their minds, as well as the vivid pictures we had painted of what would happen if they violated Oxleas Wood, the Government backed down. For me the Oxleas campaign had meant hours of hard work in meetings held in draughty halls on dark, rainy nights trying to get the best campaign that I could. For hundreds of local people it had been years of struggle. Was it worth it? Definitely. Oxleas was a turning point. We’d shown how people power could stop roads, a lesson that was quickly learnt right across the country. We’d shown that the environment movement, when it’s focused and working in harmony with local communities, could win. And of course the peace and beauty of OxleasWood has been preserved. The Hedgerow on the eastern side of the meadow is composed of mainly hawthorn (Crataegus spp) with some self-seeded oak. This hedgerow is rather special as it contains some examples of butchers broom (Ruscus aculeatus), which is used as an indicator of ancient woodland, as it rarely grows in regenerated woodland. It was the presence of this plant that aided the campaign to stop the East London River Crossing putting a road through Oxleas Wood. This hedgerow was re-laid in 2004 by the GLLAB New Deal project. Yes a hard fought battle, but a battle we have won, & as Jonathan Bray says the campaign was a template for similar protests right across the country. Right now Oxleas is he most famous wood in Britain. But it wasn’t ever thus. Only a few years ago a small number of people were desperate to bring Oxleas Wood, then little-known outside South-East London, to the attention of the nation. How they achieved this, and defeated the mighty machine of the Department of Transport in the process is an inspiration to us all and a wonderful message of hope for every one of the small groups of people fighting road schemes in faraway places… From 1936 the Roads Lobby had pressed for this road – a bridge over the Thames, plus a six lane highway that would have destroyed hundreds of homes and decimated the ancient Oxleas Wood – to complete the link between London’s North and South Circulars and thus provide an Inner Ring Road for the capital. It was a critical road. The local campaigners lost two public inquiries. They then formed an alliance involving national groups and pinpointed Oxleas Wood as the most eye-catching element in their campaign. The ‘Save Oxleas Wood’ campaign resonated around Europe. Tens of thousands of people pledged to ‘beat the bulldozer’ to save it. Fearful of a direct action uprising just after Twyford Down, the Government dropped the road scheme. Apparently 150 road building schemes were eventually dropped, as you say oxleas woods proved something of a landmark. I know this is an old post but I am a university student doing my dissertation on the Oxleas Woods protests and would love as much information as possible, if you know anyone who was there, have any photos or would like to talk to me about your experience I would appreciate it so much, even the smallest bit of information could go a long way. thank you very much and please get in touch!